I'm not afraid to speak my mind on many issues especially when it comes to sports. You'll never see me post my thoughts on the upcoming Presidential Election featuring Donald Trump vs Hillary Clinton. I will occasionally share a post and see what other people have to say. The only prediction I will make is that one of these two will win unless former New Mexico Governor, Gary Johnson, the 2016 Libertarian Presidential Nominee pulls off the biggest upset ever and surprises all of us. I have better things to do than to get into needless arguments or debates that would raise my blood pressure which would cause me to get me sick. Thanks, but no thanks! I would rather microwave a grilled cheese sandwich for four minutes. This sandwich is so hard that you could lose a tooth or break a triple pane window. I actually cooked this sandwich when I was a student at the University of South Florida when I was learning how to use microwave ovens. I just tossed the sandwich. But this beats landing into the emergency room for all the wrong reasons. Once again, talking about politics isn't my game. There is too much stress so there is no reason to add to it! If I am with an individual/s where the conversation gets too intense, then I politely leave the premises! The only Publications which thrive on Presidential Elections, are our beloved Comic Books. With the Presidential Election one week from tomorrow, I've decided to lighten the mood in what appears to be one of the most anticipated and interesting elections in recent history. I hope you learn and enjoy what you're about to read. Did you know that Donald Trump was the owner of the New Jersey Generals of the defunct Spring United States Football League in 1984? Before the 1984 USFL Championship Game, Trump invited myself and a handful of other reporters for lunch in his suite at the Sheraton Hotel in Downtown Tampa, FL. We spent an hour with him and I'm sure if I saw him, he'd remember me (nobody forgets me, I tend to leave a lasting impression). I asked Trump what his vision was for a fledgling league which had good stadium leases plus strong National TV Deals. 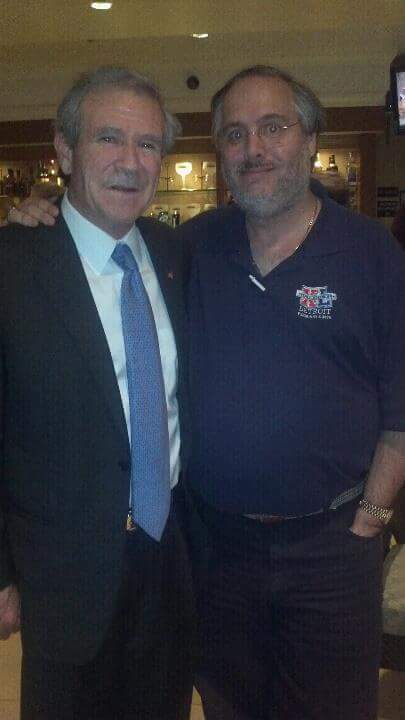 He told me that he wanted the USFL to be as big as the NFL and was very polite to this young 21-year old sports writer. Unfortunately, Trump's vision was 20/100 as he convinced the other owners to compete in the fall with the NFL, which became a disaster due to conflicts pertaining to stadium leases and the National TV Contracts. The USFL sued the NFL and won a lawsuit. They won a $3 settlement and netted $1 which signaled the official end of the league. I dare anyone to ask Trump about that on the campaign trail, as he's never owned another sports team again. I highly doubt that Trump would answer this question. At one point, Trump was looking to buy and relocate to New York, MLB's San Diego Padres, a franchise that was once owned by McDonald's Founder Ray Kroc. But that didn't come to fruition. When Buffalo Bills Founding Owner Ralph Wilson died, Trump offered $1 Billion in cash to purchase the franchise. At that time, there was speculation the team could move to Los Angeles. I actually wanted Trump to land the Bills because I knew he wanted to keep it in Western New York. But Donald lost the bid to Buffalo Sabres Owner Terry Pegula, and the teams future is on solid and stable ground. If by chance Trump wins the election, don't be surprised if his former star running back Herschel Walker is hired in some capacity to be on his administration. When former Red Sox Pitcher Curt Schilling talked about running for the Massachusetts Senate in 2018, providing his wife Shonda is on board, I was intrigued by this. There is no doubt he'd win the election by a landslide because his clutch pitching snapped the Red Sox 86-year championship drought. More importantly, he's not afraid to speak his mind on any issue. Unfortunately for Schilling, his outspoken ways led to his abrupt departure from ESPN. If Schilling does run, I hope he does well. Let's take a look at other Sports Figures that are currently worth mentioning for this story. * Former President George W. Bush once owned the Texas Rangers. He traded away a young prospect named Sammy Sosa, who went on to smash 609 home runs. Sosa played for Texas in 1989. 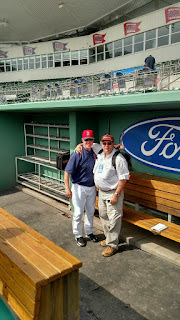 Sammy and I worked together in 1987 when I was The Director of Public Relations for the Gastonia Rangers. It was really fun at a Deerfield Beach Observer Christmas Party to take a George Bush look-a-like picture which I still get comments about. * Former Seattle Seahawks WR Steve Largent was inducted into the Pro Football Hall Of Fame. He amassed 819 receptions, 13,089 yards and 100 touchdowns. Largent was a Member of the U.S House of Representatives, from Oklahoma's 1st District from November 29, 1994 - February 15, 2002. * Former Piston Dave Bing was the face of the franchise and was inducted into the Basketball Hall of Fame as a player, plus was inducted into the College Basketball Hall of Fame in 2006. Bing entered Detroit Politics as a Democrat in 2008, announcing his intentions to run for Mayor in the city's non-partisan primary to finish the term of Kwame Kilpatrick. Kilpatrick resigned amid a corruption scandal. After winning the primary, Bing then defeated Interim Mayor Kenneth Cockrel Jr. He was sworn in as Detroit's 74th Mayor in May of 2009. Later that year, Bing was re-elected to a full term, and stayed on the job until December 31, 2013. * Current Sacramento Mayor Kevin Johnson had a good NBA Career with the Cleveland Cavaliers and Phoenix Suns. He scored 13,127 points (17.9 PPG), 6,711 assists (9.1 APG) and 1,082 steals (1.5 SPG). He had his No.7 retired by Phoenix and was a three-time NBA All-Star. Johnson also had his No.11 retired by the University of California. On March 4, 1966, Johnson, now 50, was born in Sacramento, CA. While he never played for his hometown team the Sacramento Kings, and may have caused them heartaches on the court, he did bigger things for the franchise. Johnson was at the forefront in landing a new stadium which opened this year. He saved the team by not allowing other cities like Anaheim, CA and Seattle from stealing the Kings. * My All-Time Favorite is Jack Kemp. If there is one regret I have, it's not getting a picture with Kemp when we met at Super Bowl XXXIX in Jacksonville, FL., because I didn't own a camera phone. 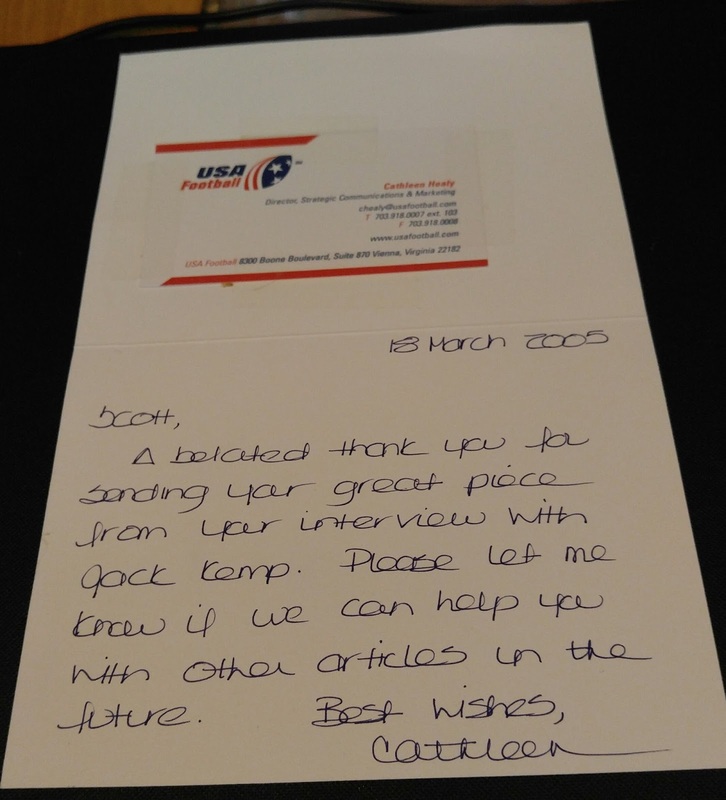 But I have the next best thing, a Thank-You Card from USA Football coming from his secretary. When I told Congressman Kemp I was a writer from Detroit, he smiled and gave me a one-on-one interview. We walked to a quiet place in the Jacksonville Convention Center. It would take too long to mention his political career/involvement though it does date back to the 1960's. He served in Congress from 1971-1989. He was a Presidential Candidate in 1988. He served on George H Bush's Cabinet from 1989-1993. He was the Vice Presidential Nominate in 1996 with Bob Dole. During Kemp's football career, he was originally selected by the Detroit Lio ns in the 17th round of the NFL Draft. Jack was cut from the team before the 1957 NFL Season began. Kemp's football career would span from 1957-1969. His accomplishments would occur mostly with the competing American Football League (AFL). He was a two-time Champion with the Buffalo Bills, a seven-time AFL All-Star, five-time First-Team All AFL, won the 1965 AFL MVP, and is currently on the Buffalo Bills Wall of Fame. He played the 1959 Season with the CFL's Calgary Stampeders. But this experience with Kemp was an absolute thrill to speak about football, in addition to politics with a well rounded individual, who treated me fantastic! There is no doubt this was one of the best memories I've had in Sports Media in 38-years. When Congressman Kemp died on May 2, 2009 because of Cancer, I have to admit that his passing stung for a long time! But Jack Kemp will always have a special place in my heart. 1. Former Basketball Star Bill Bradley--U.S Senator New Jersey from January 3, 1979-January 3, 1997. Bradley also ran in the 2000 Presidential Primaries opposing incumbent Vice President Al Gore. Bradley played 10 years for the New York Knicks as a shooting guard and small forward. He won two NBA Championships for the Knicks and was inducted into the Basketball Hall of Fame in 2006. 2. J.C Watts--Member of the U.S. House of Representatives, Oklahoma 4th District from January 3, 1995-January 3, 2003. Chairman of the House Republican Conference January 3, 1999- January 3, 2003. Watts played QB for the University of Oklahoma. He played professionally from 1981-86 in the Canadian Football League for the CFL's Ottawa Rough Riders. Watts won the Grey Cup MVP in 1981. He never played in the NFL. He spent the 1986 season with the Toronto Argonauts. 3. Heath Shuler--Member of the U.S. House of Representatives from North Carolina's 11th District. He served from January 3, 2007-January 3, 2013. He played in the NFL for the Washington Redskins, New Orleans Saints, and the Oakland Raiders. 4. Jesse Ventura--He was a Professional Wrestler from June 1974 and retired in 1986. He would become the 38th Governor of Minnesota from January 4, 1999-January 6, 2003. 5. Gerald Ford--from 1932-1934, he played center, long snapper and linebacker for the University of Michigan Football Team. Ford helped the Wolverines to undefeated seasons and national titles in 1932 and 1933. Ford held numerous political offices which culminated with The Michigan Man replacing Richard Nixon, who resigned from the Watergate Scandal. Ford took office on August 9, 1974-January 20, 1977. But what a list. As I researched this, I was amazed at how many of these athletes traded their uniforms for suits, shirts and ties. The only other athlete that I can predict will join this list is NBA Hall of Famer and Current TNT Basketball Analyst Charles Barkley. His Alma-Mater Auburn University is building a statue in his honor not only for his basketball accomplishments, but what he's meant to the Tigers overall. Whatever office that Barkley wants to run for in Alabama, I wouldn't bet against him. He's great behind the microphone, and Barkley's brash and outspoken nature landed him on national television. I could see him flourishing in politics. At any rate, when Election Day takes place in a week from tomorrow, this gives a much different perspective of where some of these Public Service People could come from. The ones mentioned in this story entertained the Public Between The Lines then proceeded to serve the Public Outside The Lines. Although the World Series between the Chicago Cubs and Cleveland Indians is almost over, it's never too late to reflect on the 2016 regular season. 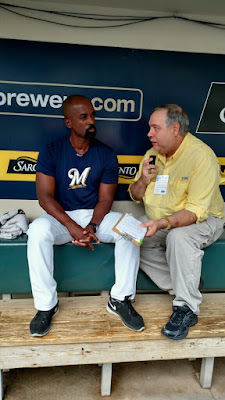 When we were in Milwaukee to see the Brewers in action against the Pittsburgh Pirates during late August, I caught up with another baseball friend Darnell Coles. 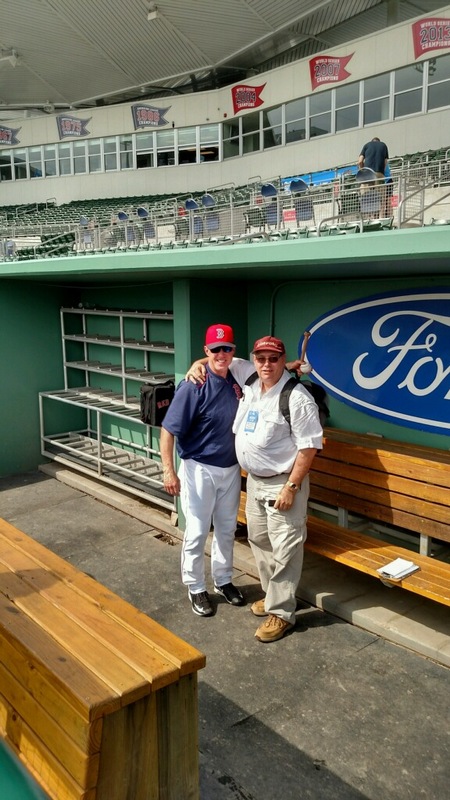 I've known Coles, 54, since Spring Training of 1986, when he was acquired by the Tigers from the Seattle Mariners. If there is an individual that's seen baseball from many different perspectives, Coles is that person. He played in the Major Leagues for 14 seasons with eight different teams: 1) Seattle, 2) Detroit, 3) Pittsburgh, 4)San Francisco, 5) Cincinnati, 6) Toronto, 7) St. Louis, and 8) Colorado. Coles managed to hang around in the Major Leagues by playing in both the infield and outfield. Darnell's Career batting totals include .245 average, 75 HR, 368 RBI, and 957 Career games. For the Tigers in 1986, he hit 20 HR, 86 RBI with a .273 average along with 521 AB, in 142 games. The 1986 campaign was his best MLB season. During his travels, Coles was a member of the 1993 World Champion Toronto Blue Jays. He is one of only 14 players ever, including Babe Ruth, to hit three homers in a game in both the National League (1987 Pirates) and the American League (1994 Blue Jays). Coles has managed in the Minor Leagues four seasons compiling a 223-268 mark with a .454 percentage. Darnell spent the 2014 season as an Assistant Hitting Coach with Detroit, his first career coaching position at the Major League Level, serving under former Tiger Wally Joyner. During Coles tenure, the Tigers led the Major Leagues in batting average (.277) and ranked second in runs (.757), OBP (.331), slugging (.426) and OBS (.757). Coles served as a Baseball Analyst for ESPN from 2001-2006. In 2016, Coles Brewers ranked 25th in MLB as his club had a .244 batting average. Milwaukee finish fourth in the NL Central with a 73-89 mark, 30.5 games back behind the Chicago Cubs (103-58). If there is a baseball lifer, Darnell is it. We had the chance to have a great conversation on many interesting topics. Q: Doesn't it seem unfortunate that the Tigers and Brewers don't meet as often? A: It's unfortunate but, the fortunate part is I can watch from afar knowing that you were part of something special there in multi facets as a player. The teams I played on there were outstanding from Tram (Alan Trammell) Lou (Whitaker) Gibby (Kirk Gibson) Chet Lemon and the whole crew. Coming back as a coach, Brad Ausmus hired me for my first Major League Coaching job working with Wally Joyner and Mr (Dave) Dombrowski so I couldn't be more grateful to them for the opportunity. Q: What was it like working with the Tigers hitters? Q. How much did the Tigers experience prepare you for your position with the Milwaukee Brewers? A: I think it did everything in preparing me for it because being an assistant in Detroit, I learned from Wally Joyner. I paid attention to detail, worked on a couple different projects that he wanted me to work on. I wanted to make sure he was satisfied with all the work being put into it. Ultimately, it allowed us to have a great working relationship. We're great friends. We call each other up every now and then to kind of bounce things off each other. Again, I couldn't be more grateful in what he's meant for me in my career. Q: What's it like to be coaching a younger team which is far less experienced and talented then what you had in Detroit? A: I think payroll has a little bit to do with it. In Detroit each and every other guy was making an enormous amount of money. At the end of the day, the work they put in, consistency of that work showing up during the game is fantastic with the way they carried themselves. The group as a whole understanding what it took to play for the guy next to him, keep the line moving next to him to do their job and allowing everybody to do theirs is a huge part as to why Detroit was successful when I was there and is successful today. Q: In your current Brewers situation, you have a much younger group and obviously they don't have the experience. How much of a challenge has it been for you dealing with a different type of situation, than in Detroit? 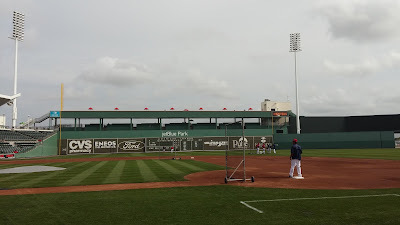 A: I think with a younger group, there is a lot of teachable moments to understand what teams are trying to do to you, what teams are trying to set you up later in the game, pitch to you with runners on base, will they not, will they give you a good pitch to hit. You have to understand and pay attention to the scoreboard. The scoreboard generally tells you everything you need to know. Q: Let's talk about Ryan Braun and former Tiger Herman Perez. Did you work with him in Detroit and how is he to coach? A:I did work with him in Detroit and got a chance to see him there. He didn't get a chance to play a lot based on the fact you had Ian Kinsler and Jose Iglesias. You have guys that played everyday in the positions he played in then it was going to be tough to get at bats. He had an opportunity to come over here was a fresh new deal for him to play a little third base, a little shortstop, a little second base, and now he has put himself in a position to play the outfield. So this allows him to getting to playing a number of positions. But it also allows him to consistently get at bats. He went to winter ball this year, lost weight, got himself in great shape, came back this year after having a great winter ball. He started the season in AAA (Colorado Springs). Consistently he did well there and he's been phenomenal. Getting him here, we've gotten him to make adjustments that have worked out. He's put himself in a position to possibly vie for a regular position at some point in time down the road. He's special to watch because he's someone who you have worked with over time that has consistently gotten better and now it's showing up in the same. That's a beautiful thing. As for Ryan Braun is Ryan Braun. He's one of the best payers in the game. To me, he's one of the top five hitters in MLB. He has a routine he does everyday understands hitting, how he's being pitched, understands situations, pays attention to detail, has a plan and the list goes on and on. There is very few guys that go about their business the way he does and the consistency of that showing up every night and you see that in the results He's a great player that's a great teammate and he's special to watch. I'm happy I get a chance to work with him everyday. 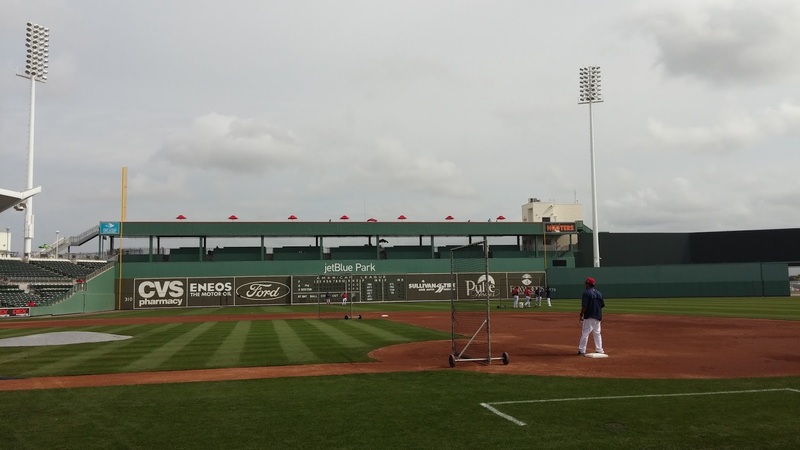 Q: What's it like working with a small market club compared to the bigger market teams around MLB? Do you embrace this challenge? A: I think the market place is what it is. We have a great fan base, as good of a ballpark (Miller Park) as there is in Major League Baseball. So that portion of it is taken care of. I think the reality of it is that we're a team that has to develop our farm system. We're doing a great job of doing that with David Sterns (General Manager) coming in and Matt Arnold his Assistant GM have put in place for us to give these guys a better opportunity in order to build a long term future. Our guys understand that they will get opportunities to play there will be a lot of teachable moments. We have to understand as coaches, the more we teach them and the better they get, that will increase our chance of being successful. I embrace any challenge of getting guys better! Q: Let's describe Milwaukee as a baseball town, Wouldn't it be scary when they do win considering they can get 35,000 fans for a sub .500 team? It makes me wonder does Milwaukee have the potential to be a Sleeping Giant once the Brewers play contending baseball. A: I think it shows that the fan base shows up every night They understand what the transitional period is. We're a team that's young and motivate that talent to be good Major League players. That takes time but our fan base is always sticking by their teams and they understand the gravity of the situation. With that said, they want to win and want to win now as much as we do. So we're trying to do it in a systematic way that allows us to win long term but financially puts us in the best possible position to be stable for a long time. Q: You worked with Brad Ausmus and now Craig Counsell. Both are young managers. Compare and contrast both skippers? A: They're both young, have played baseball for a long time, they understand how the game is played. They're both old school and came up at a time when players had to go out and play, perform and do well to continue to play in the Big Leagues. I think they both have a distinct understanding to how they want their teams to play. They're very good at making sure that the talent they have plays a brand of baseball, but each can be proud of. Like I said, I enjoy and it's been a pleasure to work with both of them. Q: Finally, Do you have a managerial aspirations one day in the big leagues? Do you understand how important patience is to get that opportunity? because the development of players sometimes comes later than others. You have to be patient enough to stick with the program, understand what the program is all about, but to methodically add and subtract things that don't prevent that player from being successful so that you can get the best out of them daily. I feel like I'm really good at that. I learned this as a player and it took me sometime to catch on and experience to learn it. Patience has carried me now that I'm coaching and I'll have a lot as a manager. There is no doubt in my mind that Coles has many good years left in baseball. At age 54, his student of the game mentality means the sky is the limits as time progresses. There are never enough good minds in baseball. I will be looking forward where/when our paths cross in the future.